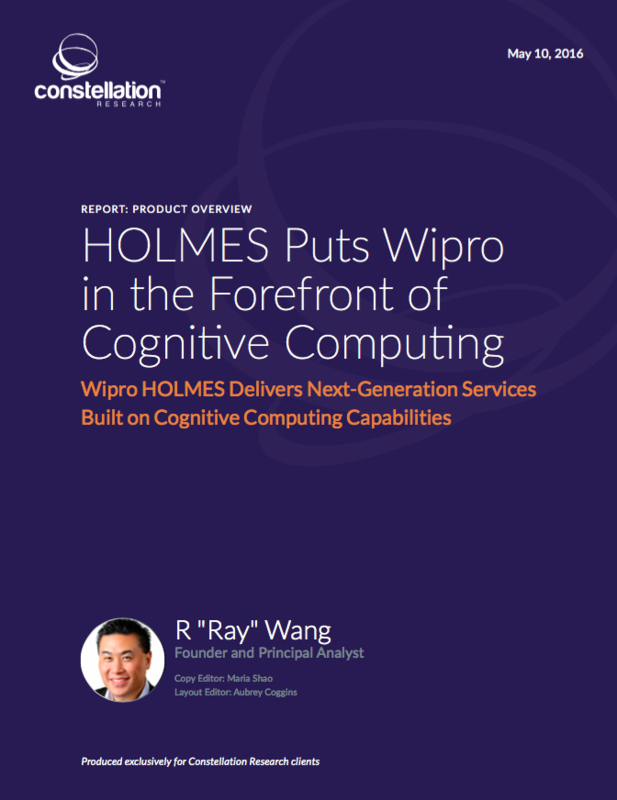 HOLMES Puts Wipro in the Forefront of Cognitive Computing | Constellation Research Inc.
Wipro is an information technology, consulting, and outsourcing firm serving more than 900 clients from the Fortune 1000. Wipro operates in more than 175 cities worldwide and generated $7.7 billion in revenue in its 2015-16 fiscal year. Its global workforce has more than 170,000 individuals. The company operates in two segments: IT Services and IT Products. IT Services include consulting, development, re-engineering and maintenance, systems integration, packaged implementation, global infrastructure services, digital, business process services, and custom application design. IT Products include computing, storage, networking, security and software. As technology services vendors gear up to tap into the $100.7 billion Digital Transformation Services business, Wipro is quietly but steadily emerging as one of the major players. Constellation believes that service providers that have an early edge in building platforms will have the opportunity to emerge as new leaders in the marketplace. Wipro’s HOLMES platform represents a software and services offering in the cognitive computing platforms and solutions category. This artificial intelligence-based platform allows Wipro to provide clients with a differentiated and disruptive offering among the classical IT services firms.